Nations Press feature news BREAKING: An Army Reservist Suspect for Biker's Slay Already ARRESTED!-Read Here! 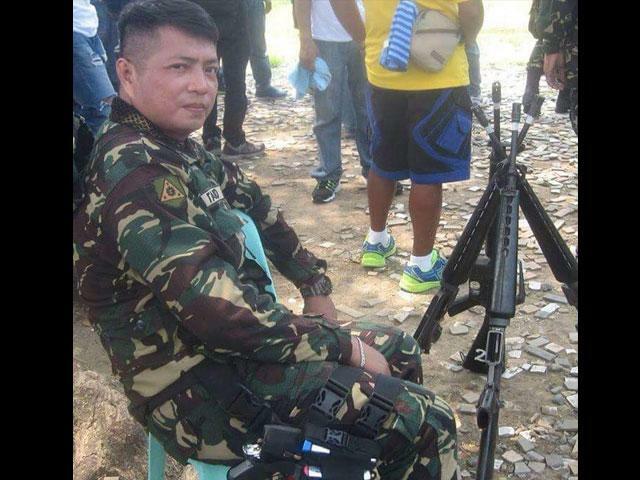 BREAKING: An Army Reservist Suspect for Biker's Slay Already ARRESTED!-Read Here! SPONSORED LINKS Vhon Martin Tanto, the suspect in the killing of a cyclist in Quiapo following an altercation on Monday night, was arrested in Masbate on Friday. A report by GMA News' Jun Veneracion on Balitanghali, citing Army chief Lt. Gen. Eduardo Año, said Tanto was arrested at 11:40 a.m. in East Milagros by combined elements of the Army's Intelligence and Security Group, 9th Infantry Division and local police. Tanto, an Army reservist, is the suspect in the killing of Mark Vincent Garalde during an altercation along P. Casal Street on Monday night. The Philippine Army had earlier said it will do its share in locating Tanto, who is assigned with the 1301st Community Defense Center, National Capital Regional Community Defense Group of the Army Reserve Command based in Caloocan City. Tanto, 39, was positively identified by witnesses through the pictures on his social media account. The Hyundai Eon seen on the CCTV footage of the incident was traced to him through its conduction sticker. The footage, which has become viral on social media, showed Tanto shooting Garalde several times at point blank after they engaged in a fistfight. A bystander is in critical condition after being hit by a stray bullet.The report said Tanto will be turned over to the Manila Police District.